Spread over 6 acres of landscaped gardens, the luxurious Vivanta by Taj Hari Mahal is built to resemble a 14th century royal fort. 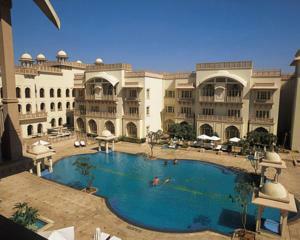 Pampering spa treatments, a large outdoor pool and a 24-hour fitness centre are available. Charming air-conditioned rooms feature original wall paintings, large windows and an ergonomic work space. Overlooking the garden or pool, all rooms have a flat-screen TV and free tea/coffee making facilities. Bathrooms have massage showers and a bathtub. Presenting Moghul-inspired domes and grand architecture, Vivanta by Taj Hari Mahal is located 3.5 km from the Jodhpur Railway Station and 4 km from Jodhpur Airport. This desert oasis also provides free parking. The hotel's tour desk can help to arrange customised tour itineraries for guests. There is also a library, beauty salon and a 24-hour business centre. Laptops and local SIM cards are also available for rental. Modern Rajasthani and Continental dishes can be enjoyed at Latitude, which also features live traditional music performances. Authentic Cantonese and Szechuan cuisines are served at The Good Earth. Cocktails are available at Ola Bar. Rooms: Hotel Rooms: 93, Hotel Chain: Taj Hotels & Resorts. Wi-Fi is available in the entire hotel and costs INR 138 per 30 minutes. Free! One child under 6 years stays free of charge when using existing beds. One older child or adult is charged INR 1500 per night and person in an extra bed. Maximum capacity of extra beds in a room is 1. There is baby beds in a room is 0 capacity for cots in the room. Any type of extra bed or crib is upon request and needs to be confirmed by the hotel. Supplements will not be calculated automatically in the total costs and have to be paid separately in the hotel.